Oil cleansing method or (OCM) is the art of using natural oils to cleanse your skin. This technique is instrumental in removing and melting away makeup, dirt, and impurities trapped in the skin. If you have oily skin like I do, you can absolutely benefit from oil cleansing too. Regular oil cleansing will help heal your skin from acne, blackhead, whitehead, and blemishes. What Does Oil Cleansing Do? In Simple terms, when oils are massaged into the skin, it binds to impurities, pulling out dirt and grime and the 'bad oils' that cause acne and other skin irritations leaving the skin clean, soft, and hydrated. Fact: Oil dissolves oil. One of the most fundamental principals of chemistry is that “like dissolves like.” The best way to dissolve a non-polar solvent like sebum/oil is by using another non-polar solvent similar in composition: Other oils. By using the right oils, you can cleanse your pores of dirt and bacteria naturally, gently and efficiently, while replacing the dirty oil with beneficial ones extracted from natural botanicals, vegetables, and fruit that heal, protect and nourish your skin. When done correctly and consistently, the OCM can clear the skin from issues like oily skin, dry skin, sensitive skin, blackheads, whiteheads and other problems caused by mild to moderate acne–while leaving your skin healthy, balanced and properly moisturized. Most oils have wonderful skin benefits, and you should think of adding oil cleansing to your skincare regimen. I have a two-part post on oil for skincare, and it's benefit here and here. Oil cleansing can address skin concerns such as dryness, dullness, acne, anti-aging, hyperpigmentation, reduce skin inflammation, and it can help produce collagen, tone and tighten the skin, plus loads more benefits. 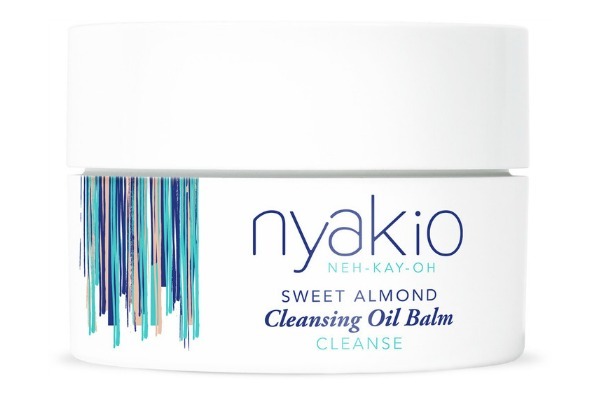 Let's take a look at the benefits of sweet almond oil and why it's one of the best oils to use for skin cleansing, and why Nyakio got it right with their cleansing balm. Sweet Almond Oil is light in texture, hypoallergenic (won't cause an allergic reaction to your skin, so it's great for sensitive skin) and it quickly absorbs into the skin. Sweet Almond Oil when warmed and massaged into the skin can gently dislodge debris from deep within skin pores and follicles. Because of its high Vitamin A content, it can prevent future acne problems. Sweet Almond Oil can also help with antiaging and help renew the cells in your face. This oil will also help lighten your skin naturally if you suffer from acne scars and skin problems such as eczema and psoriasis. Sweet Almond Oil Is known to be one of the best oils to use as a natural makeup remover. Nyakio's cleansing balm is very light in texture and feels like a moisturizer when applied to the skin. It quickly absorbs into the skin and doesn't feel greasy or tacky. It has a light scent and not overpowering which is a plus for me. The Nyakio cleansing balm transforms from a balm into an oil when applied to the skin. It gently removes makeup, dirt, and impurities. First of all, I steam up my face to open my pores, then I scoop out a small amount of the balm and rub it in between my palm to warm it up, I then apply it to my face and massage my skin gently in circular motion. I then soak my microfiber face cloth in warm water, squeeze out the excess water and gently wipe off the oil from my face. I repeat this step one more time, and that's all it takes to reap the excellent benefits of Oil Cleansing. It's straightforward and not a complicated skin care regimen. I do this 3 to 4 times a week, and I love how my skin feels. Nyakio's cleansing balm is formulated without sulfates, phthalates, parabens, mineral oil, petrolatum, formaldehyde, butylene glycol. *I got sent this product for review purposes, all thought and opinions are my own. What's your favorite oil to use for oil cleansing? This product is amazing, you will love it. Ohh I love everything that contains almonds! Me too! Thanks for reading doll. I've read about the benefits of Sweet Almond Oil and it sounds fantastic! The name sounds Japanese. Its always a yes from me when it comes to Asian skincare brands. Lol, Nicole probably i should have clarified in the post, this brand is African, and the ingredients are sourced naturtally. Thanks for reading doll!